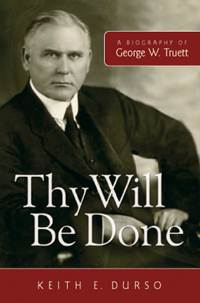 Born in 1867 just west of Hayesville, North Carolina, George W. Truett grew up to be one of the outstanding Baptist preachers of the twentieth century. He moved to Whitewright, Texas, in 1889 and planned to practice law. His Baptist church in Whitewright, however, ordained him to the ministry in 1890, ignoring his vigorous protest against such action. Truett first gained notice in Texas when, as Baylor University’s financial agent (1891–1893), he raised $92,000 to eradicate the university’s debt. He entered Baylor in fall 1893 and graduated in 1897. That same year, he accepted the call of First Baptist Church, Dallas, Texas, thus beginning his forty-seven-year ministry (1897–1944) as the church’s pastor. Blessed with an almost unbelievable capacity for work, Truett, in addition to his responsibilities to his Dallas congregation, averaged nearly six revivals each year and was in constant demand as a speaker and as a fundraiser. He was also blessed with a church that permitted him to minister away from Dallas, sometimes for months at a time. During World War I, on what he called his “great journey,” Truett spent six months preaching to Allied forces in Ireland, England, France, and Germany. In 1930, he preached for two and a half months in several South American countries. As president of the Baptist World Alliance (1934–1939), Truett spent six months (1935–1936) preaching in East Asia and two months (1937) preaching in Europe. Best known for his advocacy of religious liberty, Truett also helped found Baylor Hospital in Dallas. Less known about Truett was his understanding of stewardship. Money meant nothing to him, and in twenty-three of his forty-seven years in Dallas, he led his church to spend more money on other missions and benevolences than on its own programs.